“Friendship” may not technically be in the security guard job description, but that hasn’t stopped Officer Ronald Saladin from becoming besties with one of the kids he protects and serves. 6-year-old Braylon Henson first became best friends with School Resource Officer Ronald Saladin because of his genetic disorder. The first grader suffers from ectodermal dysplasia – a condition that means he was born without sweat glands. Braylon cannot go outside if the temperature is above 74 degrees Fahrenheit (23 degrees Celsius) because he may overheat. So while all of his classmates were outside enjoying recess at the Bay Minette Elementary School in Alabama, Braylon had to stay inside. When Saladin saw Braylon sitting by himself, however, he asked the youngster if he would like to patrol the school with him – and they have been best buds ever since. The friendship has ensured a new level of popularity for Braylon amongst his fellow students. 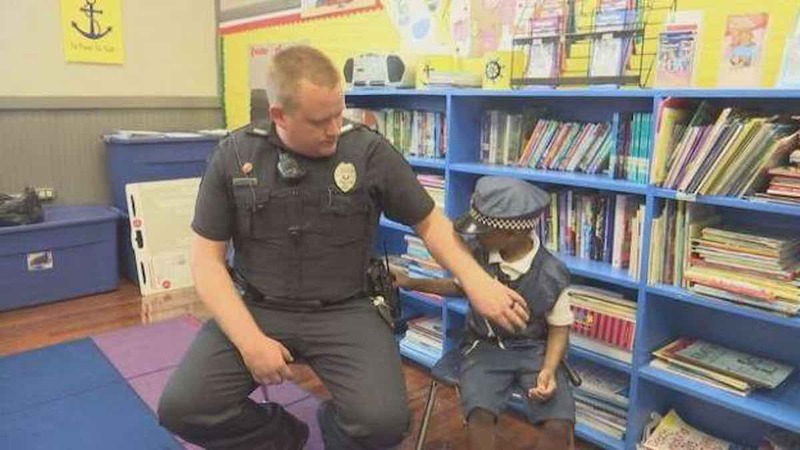 Saladin even bought Braylon a little police officer’s uniform so he could look the part for their walks through the school together.